Chemistry is essential in modern society. The electronics at the heart of your mobile phone, the fibre optics which bring you high-speed broadband, most of the fabrics and dyes in the clothes you wear – none of these would exist without a thorough understanding of the chemical properties of substances. 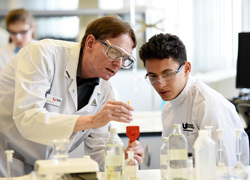 Teesside University is located in the North East of England - home to some of the most advanced chemical, pharmaceutical and biotechnology companies in the world. The employment-focused nature of this degree takes full advantage of the industries in our region to develop the skills and knowledge that employers seek in chemistry graduates. In the first year, the modules build on pre-existing knowledge and ensure a solid foundation in fundamental chemical principles. The Introduction to Organic Chemistry, Analytical Chemistry and Introduction to Inorganic and Physical Chemistry modules include weekly laboratory sessions, illustrating concepts from lectures while providing a thorough grounding in the techniques and habits of chemical experimentation. In the group project module Chemistry in Practice, you learn how to carry out COSHH and risk assessments before trying out your own experiments. Core Skills for Chemical Sciences delivers the mathematical, statistical and software skills needed for processing experimental data. In the second year you study the three traditional branches of chemistry in greater depth. In the Integrated Laboratory module all-day practical classes and extended exercises help prepare you for your final-year project and the working environment in an industrial, analytical or research laboratory. Science Research Methods and Proposal has a direct link to your final-year project – you prepare a mock grant application which includes aspects of literature searching, costing and written communication aimed at different audiences. In the final year you continue your study of all of the traditional academic branches of chemistry in the modules Advanced Physical and Analytical Chemistry, Advanced Organic Chemistry and Advanced Inorganic Chemistry. Some specialisation is also available – you can replace one of these modules with options in medicinal, biological or environmental chemistry. This module reviews and extends your knowledge of fundamental chemical concepts, and demonstrates how they are applied to enable you to understand biological molecules. It is delivered through a series of lectures and associated tutorials, along with six laboratory sessions focusing on basic practical techniques in chemistry and biochemistry. It is assessed through a laboratory report (50%) and a two-hour end exam (50%). This module introduces you to a range of key physico-chemical principles. You develop your knowledge and understanding of the relationships between electronic structure, chemical structure and chemical reactivity. You learn about the quantum mechanical nature of matter and how this relates to the chemical and physical behaviour of materials. You develop an understanding of periodicity to be able to use the periodic table and electronic theories of bonding to predict molecular shape and reactivity. The periodic table also provides the basis for studying descriptive chemistry of the main group elements and first row transition metals. You are introduced to the principles of thermodynamics and electrochemistry. The module is delivered through a combination of lectures, tutorials and laboratories. It is assessed through a laboratory notebook (50%) and a two-hour exam (50%). In this module you are taught the key foundations to organic chemistry. You learn to combine multiple sources of information, for example pKa and electronegativity, to predict and explain organic reactivity, and how to apply spectroscopic techniques, for example nuclear magnetic resonance spectroscopy. The module is delivered through a combination of lectures, tutorials and laboratories. It is assessed through a laboratory notebook (50%) and a two-hour exam (50%). Many of the metallic elements in the d- and f-blocks of the periodic table are of considerable industrial importance, and their compounds often possess useful optical or magnetic properties. This module explores the periodic trends, reactivity and practical applications of d- and f-block metals, as well as the chemistry of coordination complexes. Organometallic compounds are important as reagents in organic synthesis and as homogeneous catalysts in the large-scale manufacture of simple organics such as acetic acid. You cover the structure, properties and reaction mechanisms of a range of organometallic compounds here. This module is delivered through a combination of lectures, laboratories and tutorials. It is assessed through a laboratory report and results (40%), and a two-hour exam (60%). A series of detailed chemical practicals in which you synthesise and analyse organic and inorganic compounds, and investigate physicochemical phenomena are carried out in this module. The laboratory sessions introduce you to more advanced synthetic techniques (such as inert-atmosphere manipulation for air-sensitive compounds) and analytical tools (such as hyphenated chromatographic techniques) and strengthen existing laboratory skills. The module culminates in an extended exercise running over several weeks, providing realistic experience of industrial practice and academic research. The module is delivered through laboratory sessions. Assessment is based on the quality of experimental results, such as yield and quality of samples synthesised, accuracy and precision of analyses, linearity of calibration graphs (70%), and on a report in the form of a journal article (30%). Physical chemistry is essential for our understanding of reaction chemistry and chemistry in the world around us. The extent, speed and mechanism of chemical reactions and the nature and structure of the products of reaction are all explained by modern chemists through our understanding of physical chemistry. In this module you explore the important role that the fundamental ideas in quantum mechanics have in developing and understanding spectroscopic techniques. You are also introduced to the methods used by physical chemists to describe and model chemical change to arrive at a deep physical understanding of chemical processes. This module is delivered through a combination of lectures, laboratories and tutorials. It is assessed through a laboratory notebook (40%) and two-hour exam (60%). Knowledge of fundamental principles of inorganic chemistry are applied to develop an understanding of advanced topics, such as the role of metals in biochemistry, the mechanisms of inorganic reactions, alternative models of chemical bonding, and the structure and properties of solid-state compounds with applications in electronics or solar energy conversion. The module is delivered through a series of lectures and tutorials. It is assessed through a problem-solving exercise and a short essay (30%), and an exam (70%). You build on prior knowledge of organic chemistry, focusing on the chemistry of carbenes, organometallics, rearrangements and fragmentations and asymmetric synthesis. You also consider the synthesis of natural products and drug molecules with examples of the current state of the art in organic chemistry. You extend and apply your understanding of physical and analytical chemistry to intellectually demanding topics, and selected areas of current research in physical and analytical chemistry. The module is delivered through a combination of lectures and tutorials. It is assessed by an oral defence of a presentation (30%) and a three-hour exam (70%). Chemical science plays a key role in understanding and responding to the sustainability challenges faced by the global community. In this module you develop an understanding of the earth as a chemical system and appreciate the chemistry (and chemical complexity) of the clean and polluted environment. As the global community places increasing burdens on resources and ecosystem services such as the capability to regulate climate, chemists are central to the development of technological solutions to ensure prosperity throughout the 21st century. The module is delivered through a series of lectures and supported by tutorials and seminars. Assessment is through two components – a three-hour closed-book examination (70%) and a written assignment (30%). You develop your understanding of the concepts of a drugable target and of the toxicity effects of a drug. It takes a case study approach to develop your understanding of specific drug targets and therapeutic agents, following the lifecycle of a drug from discovery to clinical trial. The module will emphasises the differences between small molecules, biologics and therapies based on stem cells. You have a range of lectures, seminars and hands-on laboratory sessions. Some modules are largely student centred, you learn by carrying out independent tasks rather than attending lectures. Part of your course also involves a substantial research-based project. Your course involves a range of assessments including problem-solving assignments, essays, presentations, laboratory results and record keeping, report writing, group work and examinations. In addition to a solid grounding in chemistry, a chemistry degree provides you with a range of skills, such as numeracy, data handling and analysis, teamwork and problem solving, which are highly valued by employers. The chemical industry is one of the most important contributors to the UK economy and provides excellent career prospects for our chemistry graduates. But graduates can seek employment in a wide range of industries and organisations, ranging from pharmaceuticals, environmental agencies, processing industries, food, manufacturing and product development, to surprising areas such as publishing and journalism, automotive and aerospace industries, IT and telecommunications, law and business, teaching and healthcare. Megan studies part-time alongside her role as an Experimental Scientist for DuPont Teijin Films. 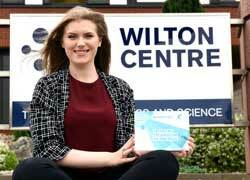 As part of her year placement, Giordaina worked as a laboratory technician at Covance in Harrogate. She worked in the central dispensary department where all drugs sent to the company are made into formulations ready to be tested. 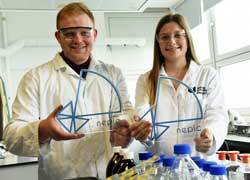 A high flying chemistry student has received a national award for her scientific work after impressing judges for two years in a row. Young scientists from a range of regional colleges visited Teesside University to put their problem solving skills to the test.